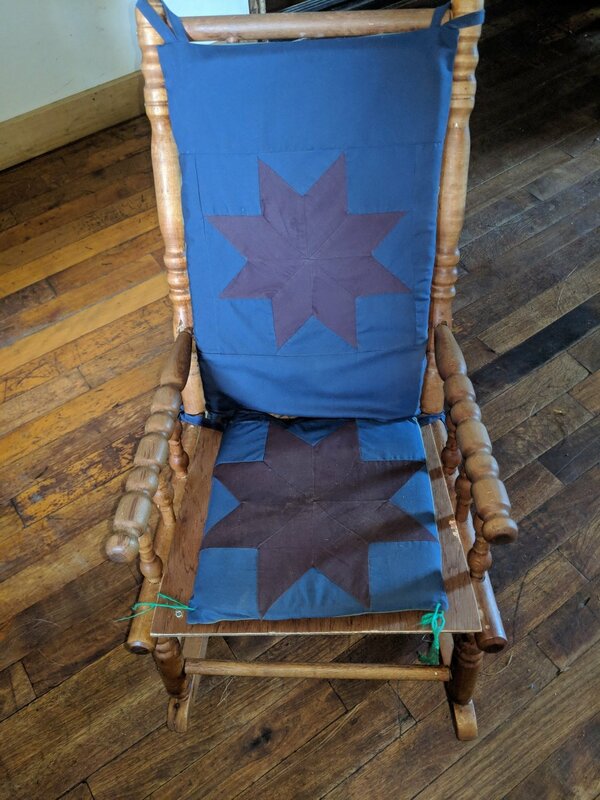 You are looking at an Amish hand crafted custom seat cushion. One piece for the back of the chair tying at the top and one piece for the bottom of the chair tying at back and front. You will be able to select from several different patterns in the drop down menu including: Ohio Star, Strip, Stairway, Lone Star, Crazy, 8 Pointed Star, and Brick. The artist will be working in her prefered color pallet of blues, purples, and greens. You will also be able to select a blues only pallet in the drop down. If you would like a pattern done in a color that is not part of this artists collection, please reach out to us via email sales@shopsmallfarms.com so that we can coordinate a custom piece for you. Please let us know height and width of the back of your chair as well as the height and width of the seat.